The featured image of the Sopwith Camels of the U.S. 148th American Aero Squadron at Petite Sythe (today part of Dunkirk), France, on 6 August 1918, is taken from the National Archives and is in the public domain. 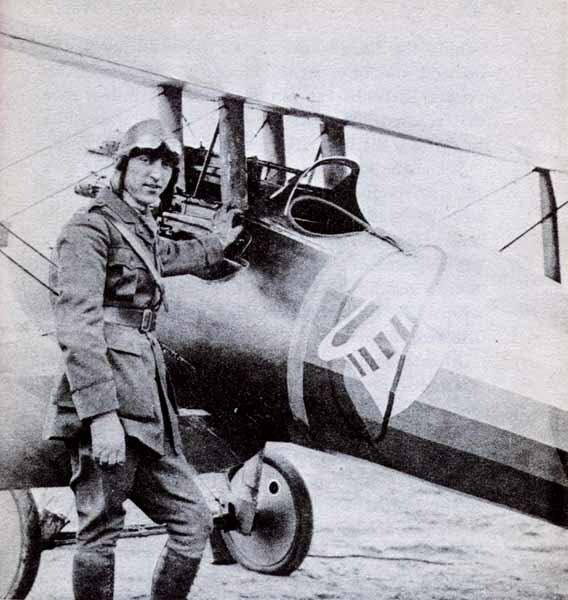 Captain GF Malley, Australian Flying Corps standing next to his Sopwith Camel in 1918. Image is in the public domain. 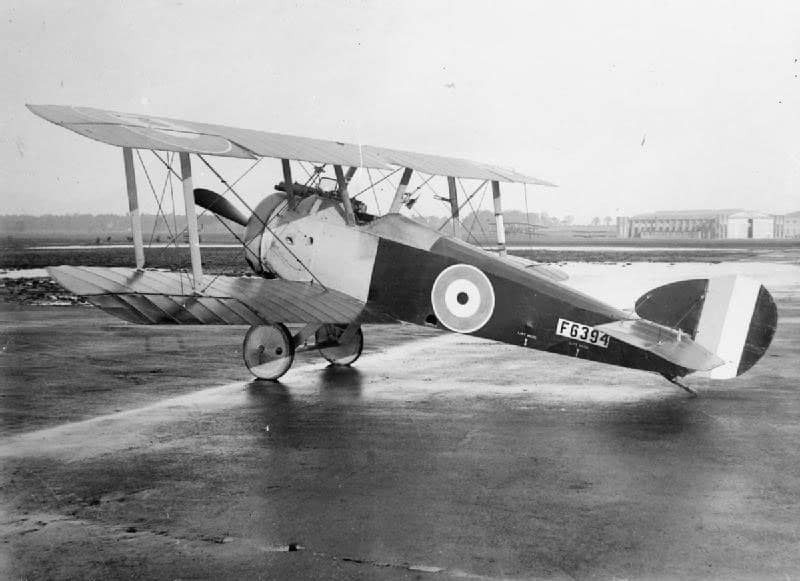 The Sopwith Camel was a single-seat biplane with staggered (upper wing forward) wings of equal area, the lower of which featured a three-degree dihedral, whereas the top had none1. It featured conventional landing gear and was constructed wood with fabric covering, with some light alloy skinning over the fuselage toward the engine4. The original Camel was armed with two 7mm Vickers machine guns that were synchronized to fire through the propeller (a feat of engineering that is still impressive, especially given the time) and had the ability to carry up to four 25 lb (11 kg) Cooper bombs fastened on a rack underneath the fuselage.2 Other variants moved the position of the guns, some up to the wings, and experimental ground attack specific versions angled the guns downward for more effective strafing and added armor plating, but it never saw production. The Sopwith Camel was initially powered by a 110 horsepower (82 kW) Clerget engine but was shortly upgraded to a 130 HP (96.9 kW) Clerget 9-cylinder rotary engine connected to a wooden two-blade propeller. The Clerget engine had a tendency to choke and quit if the fuel-air mixture was not properly leaned, and being fairly tail heavy in level flight, the Camel would tend to stall and spin without power.5 Because of the Camels’ design, spins did not usually end well for the pilot. 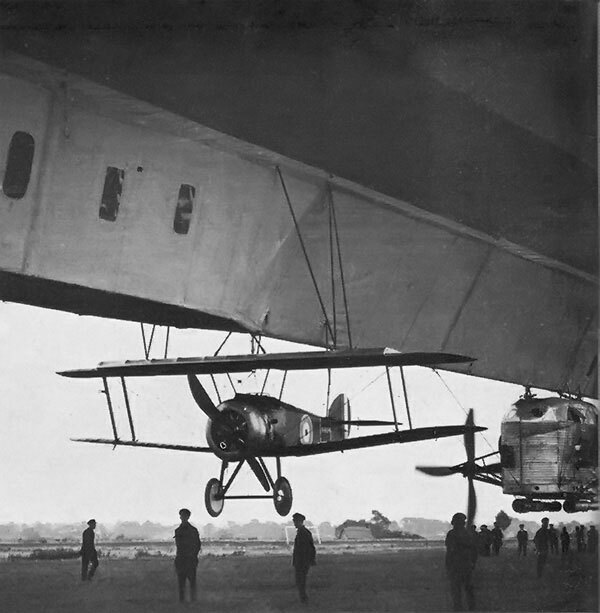 Though there’s no specifics available regarding ground roll on takeoff and landing, warbird buffs seem to agree the takeoff distance for the Sopwith Camel to be no more than 700 or so feet, saying the WWI pilots would see a 1,000 foot-long (300 m) pasture as “the height of luxury”7. Recreations of the original Camel design can be seen in videos getting off the ground in less than that, but there’s no accounting for historical accuracy. This image of a Sopwith Camel is from the Imperial War Museum and is in the public domain. As mentioned earlier, the handling of the Sopwith Camel was less than pleasant. The fighter pilots who flew it said that it could get you three things; a wooden cross, the Red Cross, or a Victoria Cross1. The Victoria Cross is the highest honor available in the United Kingdom, awarded for gallantry “in the face of the enemy” to members of the British armed forces. Luckily for Sopwith Camel pilots, it can be awarded posthumously. I’m only slightly kidding. During WWI, 413 pilots died in combat, and 385 died from non-combat causes while flying a Sopwith Camel.7 The biggest detriment to its handling was its intense torque and forward center of gravity. 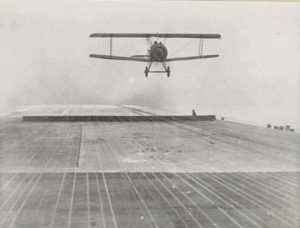 A Sopwith Camel coming in for landing on an aircraft carrier. Image from the British Air Ministry, under the public domain. The Camel turned slowly to the left and put it into a nose-up attitude, which then caused sinkage and bled off the airspeed.1 Contrarily, its right-hand turns were a sight to behold. The powerful torque caused the Camel to turn right sharply, and it tended to end up in a nose-down attitude, which increased airspeed. According to some sources,1 the Sopwith Camel turned so much faster to the right that pilots who had to turn left would choose to do a 270-degree turn to the right. 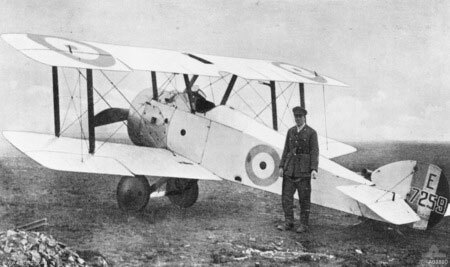 In addition to the original Sopwith Camel model, the F.1, there were five variants, including experimental models. 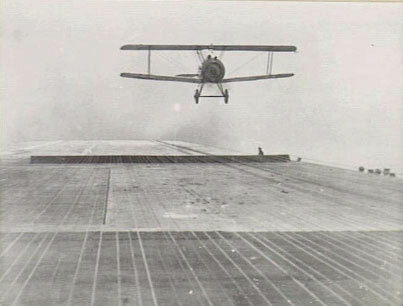 The two most interesting and influential of which were the 2F.1 Ship Camel and the Comic Night Fighter Camel. The Comic night fighter variant on the Sopwith Camel was designed to defend the home front against the Germans night raids. This Camel was modified significantly. The pilot sat farther back, and the two Vickers guns were replaced with twin Lewis guns fixed to the upper wing, which could fire incendiary ammunition without blinding the pilot. 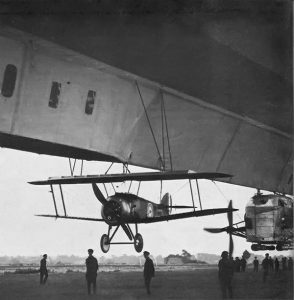 A Sopwith Camel slung beneath a British airship, photo is in the public domain. Unfortunately, there are only eight surviving Sopwith Camels, none of which are for sale. They cost approximately $2,300 back in 1917, and inflation skyrockets that to around $163,000.7 You could probably quintuple that to account for historical and collector value, and that might still be too low of an asking price. Companies like Airdrome Aeroplanes design kits for replica WWI aircraft, and if you’re just itching to own a Camel of your own, you can now build a very historically accurate one. The kit is available for just under $14,000 (no engine included) for those history buffs out there. The Sopwith Camel was an intimidating airplane to many new pilots, and for very good reasons. Luckily for the Allies, it was more dangerous to their enemies than it was to their own pilots. The surviving eight remain ground-bound in rightfully earned museum displays,6 but their impact on the war effort is felt to this day. Without the Sopwith Camel and the brave pilots who managed to fly them, the world might be a very different place. That’s funny. I thought a ground emplaced machine gunner got The Red Baron. Also, Roy Brown was flying the Sopwith S.E 5A when he had his encounter with Red Baron. There is definitely debate regarding who fired the shot that killed the Red Baron, with a majority believing the shot would have had to come from the ground, but Brown was credited with the kill. Also, the sources I’ve read all refer to Brown as having been flying a Sopwith Camel. If those are incorrect, please send me some sources for the S.E 5A. Thanks.